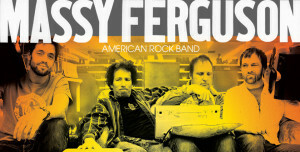 Massy Ferguson, Seattle’s world-class, quintessential bar band, is heading to Austin for SXSW this week. The boys are pumped to play there again and will perform at least six shows at numerous venues around town. Check Massy Ferguson’s website for their SXSW schedule, music, merch and other information. My husband and I saw Massy Ferguson perform at Bellingham’s Green Frog on Friday, March 7. The talented band includes Ethan Anderson (bass/vocals/flute), Adam Monda (guitar/vocals/harmonica), Dave Goedde (drums), and Tony Mann (keys). They play serious rock ‘n’ roll with an Americana twist, but never take themselves too seriously. Once again, they brought their rockin’ energy to a fully primed audience. Unlike the Tagaris Winery show attendees (I’ll forgive them, though–it was 100 degrees that day), the ‘Hamsters came to party. Frontman Ethan Anderson commanded the rowdy crowd to get up and dance. Dancing is required at every show, including, but not limited to: two-step, freestyle or air guitar. It didn’t take much encouragement to get the gang dancing. The women of our group–Massy Ferguson virgins, obeyed Ethan’s words and joined the happy, dancing revelers. Our friends eventually ended up on the stage as Guest Female Percussionists (a usual occurrence at MF shows). I stayed on the dance floor, though, and captured evidence–uh, took pictures. Their set at The Green Frog included high-voltage songs spanning over three full albums, two EP’s and a couple of covers. They opened with a fantastic new song entitled “Backwoods in the Morning” and sprinkled in a few other songs throughout the night that will appear on an upcoming album later this summer. Midway through the set, they played the poppy “Hello!”, the first track off their most recent album,Victory and Ruins, released in 2013. Near the end of the night, The Flute came out. Ethan held it up ceremoniously as the audience cheered. He dove into Men At Work’s “Down Under”, rocked the flute solo, and followed it with “Bum Drunk” off their Damaged Goods EP. The audience danced and sang along in a wild frenzy. Yeah, it was a great night. If you happen to go to one of Massy Ferguson’s lively shows at SXSW, please report back here and spread the word!